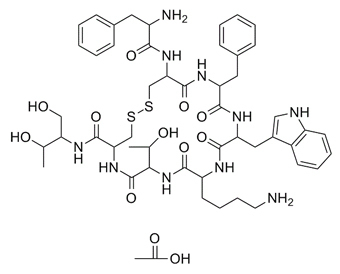 Octreotide is a synthetic long-acting cyclic octapeptide with pharmacologic properties mimicking those of the natural hormone somatostatin. Octreotide is a more potent inhibitor of growth hormone, glucagon, and insulin than somatostatin. Similar to somatostatin, this agent also suppresses the luteinizing hormone response to gonadotropin-releasing hormone, decreases splanchnic blood flow, and inhibits the release of serotonin, gastrin, vasoactive intestinal peptide (VIP), secretin, motilin, pancreatic polypeptide, and thyroid stimulating hormone.
. Wang M, et al. Pharmacokinetic and pharmacodynamic study of a phospholipid-based phase separation gel for once a month administration of octreotide. J Control Release. 2016 May 28;230:45-56.
. Kim S, et al. Treatment of Gastrin-Secreting Tumor With Sustained-Release Octreotide Acetate in a Dog. J Am Anim Hosp Assoc. 2015 Nov-Dec;51(6):407-12.